Effective health care worker hand hygiene is a core strategy in the prevention of health care associated infections and the transmission of antimicrobial resistance. In 2008 the Australian Commission on Safety and Quality in Health Care (ACSQHC) engaged Hand Hygiene Australia (HHA) to implement the National Hand Hygiene Initiative (NHHI). 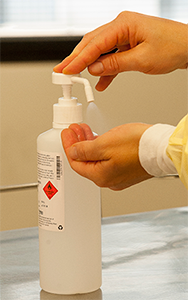 The purpose of the National Hand Hygiene Initiative (NHHI) is to develop a national approach to improving hand hygiene in Australian health care organisations and monitor its effectiveness. This initiative is based on the World Health Organisation (WHO) - World Alliance for Patient Safety campaign – “Clean Care is Safer Care” launched in 2005. Core components of the initiative include provision of alcohol-based hand rub at the point-of-care, health care worker education, and auditing with performance feedback of hand hygiene compliance according to the WHO ‘My 5 Moments for Hand Hygiene’ approach. Hand Hygiene Australia provide resources and services necessary for the implementation and sustainability of the NHHI and support the education of all Australian health care workers about the importance of hand hygiene in the prevention of health care associated infections.